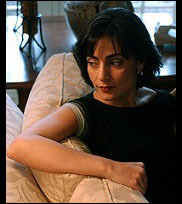 Those of you who have been following this series will know that Sibel Edmonds (pictured) had her FBI contract terminated when she discovered evidence of wrongdoing in her workplace. The Office of the Inspector General (OIG) at the US Department of Justice later investigated, and concluded that ‘many of Edmonds’s core allegations relating to the co-worker had some basis in fact and were supported by either documentary evidence or witnesses other than Edmonds’ . I’m quoting there from an unclassified summary, but the actual OIG report remains classified. Also there is a State Secret Priveleges gag order on Sibel Edmonds to prevent her speaking about her work at the FBI (on national security grounds), but she says it’s not so much national security that is being protected as corrupt U.S. officials she has overheard on wiretaps, who are in the business of stealing and selling American nuclear secrets and technology. Sibel Edmonds has found an ingenious way to ‘name’ names. She discovered that it is legal for her to publish public photos of public people, so on her website she has set up a ‘State Secrets Privelege Gallery’ . With a little homework, visitors to her website can discover who it is, and in the process she hasn’t technically ‘named’ anyone! The gallery is divided into three sections. The first section is current and former State deptartment and Pentagon officials. The second section contains congressmen from both political parties (which may explain why no-one has done anything about all this!). These congressmen have allegedly been bribed by Turkish lobbyists such as the American Turkish Council (ATC), and there are also ex-congressmen in the gallery, who are allegedly the front-men for doing the actual bribing. Apparently the modus operandi of the Turkish lobby is to bribe certain congressmen, then blackmail them into bribing others . There can be no doubt that sharing classified information with lobbying groups really happens. For example, one of the Pentagon figures in the gallery is Lawrence Franklin, ‘a former Pentagon analyst, who was jailed in 2006 for passing US defence information to lobbyists and sharing classified information with an Israeli diplomat’ . ‘He was one of the top people providing information and packages during 2000 and 2001,’ said Sibel Edmonds . The ATC is modelled closely on the Israeli lobby group the American Israel Public Affairs Committee (AIPAC), and Edmonds has said that in the FBI there was a ‘sister’ investigation to the one she was working on, investigating Israelis involved in the same kind of shady deals with the same US officials . The third section of the gallery involves people at think tanks, mainly WINEP, The Washington Institute for Near East Policy, founded by a research director for AIPAC. Luke Ryland has put names to the pictures on his blog . This brings to an end Blather.net’s five-part series ‘Black Market Nukes!’. I’m not sure we’re ever going to see the classified documents or hear the wiretaps that would vindicate Sibel Edmonds, nor see prosecutions of these powerful ‘rogues’ in the gallery (Franklin notwithstanding). Some country or organization (or individual!) may unexpectedly reveal themselves to be a nuclear power at some point, though… thanks to the nuclear black market. ‘Federal Bureau of Investigation’s Foreign Language Translation Program Follow-Up Audit Report 05-33, Appendix 7: Update on the Office of the Inspector General’s July 2004 Report, “A Review of the FBI’s Actions in Connection with Allegations Raised by Contract Linguist Sibel Edmonds”‘ pp. 40-41. Office of the Inspector General, Audit Division (January 2005). Luke Ryland interviewed on Antiwar Radio, 27 August 2008, 36 minutes into interview. Mp3. &  Chris Gourlay, Jonathan Calvert, Joe Lauria, ‘For sale: West’s deadly nuclear secrets‘, The Sunday Times, 6 January 2008. Luke Ryland interviewed on Antiwar Radio, 27 August 2008. 40 minutes, 55 seconds into interview. Mp3. Luke Ryland, ‘Sibel “names names” (in pictures! )‘, 6 January 2008. ‘So, former FBI translator Sibel Edmonds is again proven right. For more than a year Sibel has been predicting that Dennis Hastert will join a lobbying firm involved with Turkey, and now we learn that Hastert is joining Dickstein Shapiro.’ Brad Blog, 2 june 2008. The Sibel Edmonds Story in a Nutshell (interview with her by Philip Giraldi), 26 September 2009. Sibel Edmonds Finally Testifies Under Oath, 8 August 2009. ‘What Nuclear Secret Was Kerry Aide Looking for in Switzerland?‘ – Jeff Stein, Spy Talk, 5 June 2009. The mention of someone riding around with a nuclear bomb in their motorcycle sidecar in part one was a reference to Neal Stephenson’s novel Snow Crash. The title of part three, ‘Couldn’t You Keep That To Yourself?’, was a song written by Elvis Costello for Ute Lemper, which she performed on her album Punishing Kiss. ‘We’ll meet again’ was, of course, me trying to remind you of the closing credits of Dr Strangelove or: How I Learned to Stop Worrying and Love the Bomb.